The album was a fairly airtight eight song traditional album, with nary an ounce of fat to be heard on it. It has become something of a Simple Minds tradition to offer their previous two albums in an extended CD configuration. “Graffiti Soul” was released in a 2xCD version with a bashed out covers album “Searching For The Lost Boys” of questionable merit. “Big Music” had a deluxe boxed edition with a DVD and second disc with six extra tracks, one of which “Liason,” was truly world-class Simple Minds. The extras for this album were more modest in number; relegated to a hardcover CDX with three extra tracks appended to the basic eight track CD. 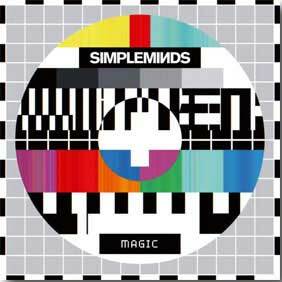 Finally, there was a B-side to the colored vinyl 7″ of “Magic” available with a pre-sale bundle from the Simple Minds webstore. It meant paying $18 for just one more song, but I’ve done worse! It was surprising when “Angel Underneath My Skin” appeared, showing perhaps not all of the “Our Secrets Are The Same” songs had been mined for their lode. It was the only non-cover version here not written by either Jim or Charlie. This was from the pen of Jim’s normally problematic brother Mark Kerr with a co-write by Erikah Karst; an unknown quantity. All of the Simple Minds songs with a Mark Kerr credit in the past have been unlistenable to me. This one actually broke the mold, though it has the same dark, drug-hazed vibe of the unappealing “Our Secrets Are The Same” material, this time leavened by having a somewhat upbeat chorus of some pop merit bolted on to the lurching, downbeat verse structure. There’s even some “la-la-las” lifted from the neighborhood of “Don’t You [Forget About Me]” that took some chutzpah. While it’s the weakest track here, I can’t judge it a failure by any means. Had all the material from the “Our Secrets Are The Same” been of this caliber, I would have bumped my 0.5 point rating to at least 1.5, if not 2.0. When the CDX package was first announced, eyebrows raised at the inclusion of the final song on the CD. “Dirty Old Town” was a folk standard from the pen of Ewan McColl. Everyone from The Dubliners to Rod Stewart [note: he’s not Scottish] have sang this one; including Simple Minds with Jimmy Johnstone taking the lead vocal before his death from motor neurone disease. This surfaced in 2006 after Johnstone’s death and I have in truth, never bothered to hear it, even though I knew about it from day one. It had been resurrected during the Simple Minds acoustic tour of the UK last year as a response to the Manchester bombing that had occurred concurrently with their tour, as MacColl had written the song about Manchester. It was hastily added to their set once they cajoled Sarah Brown into learning the song at a soundcheck. Good thing to, because the live performance as recorded here skates through this album on the immeasurable charm of Ms. Brown’s vocal; described by Kerr as sounding like Mahalia Jackson. A bit sweeter I think, but still…I can’t imagine bothering to listen to this song without Ms. Brown’s glorious performance. I’ve heard this is a duet with Kerr, but truth be told, I’ve not yet noticed him on this song. It’s way off the mood and vibe of the album, but remember; bonus tracks are the new B-sides, where bands can try something very different should they want to. Her performance utterly validates its inclusion here. Finally, the “Magic” 7″ had another fine song to offer with “Direction Of The Heart” sounding like a revisit to the familiar climes of “Theme For Great Cities.” The trance-like rhythms had lead synth lines that harkened back even further to “Real To Real Cacophony” to these ears. I enjoyed Kerr’s lower-resister lead vocals ever since hearing him branch out on “Cry’s” “One Step Closer.” I was glad that the 7″ package was worth it for the extra B-side. Knowing this band, there’s every chance that this one could show up in the next ten years with some more refinement and surprise us all. It’s got the foundations to do so. I have to say that I was shocked at how much I enjoyed this album, not only because I have been calling many Simple Minds albums for the last 20 years “the best one since ‘Sparkle In The Rain” and this one’s the best of that lot [“Neapolis,” “Cry,” “Graffiti Soul,” “Big Music”] even as I felt they might have plateaued with “Big Music,” which now seems pretty flawed next to “Walk Between Worlds.” Certainly there’s nothing in evidence here as maladroit as the title track of that one, and there’s just a higher caliber of song and performance across the board. I love all of the vocals on this album, for a start. Jim Kerr can be a terrible lead vocalist at times. His blown-out and bloviated performances in the mid-80s are legendarily awful to my ears and his penchant for overstatement can certainly dog at his heels if he’s not careful. The songs here all benefit greatly from his sense of taste and restraint that is a common thread between all of his best performances. As for subtlety, the band had set new heights in that regard with the compelling “Utopia.” The backing vocals throughout are also varied and perfect, with even Catherine A.D. not sticking out like a sore thumb. I’m certainly not a fan of her solo work, to put it mildly. The band managed to send out some impressive shoots of new growth that can’t simply be put down to lineup changes as evidenced in the booklet art. The fact remained, that Mel Gaynor, no longer in the band, was the drummer on most of the tracks here simply due to the often long gestation period of Simple Minds songs. And of these songs, I’d bet that half of them at least were simply programmed by Burchill or Owen Parker. While there’s nothing quite like a living timekeeper for this band, the reliance on drum programming does insure that the dark shadow of their stadium era can be successfully kept at bay. At first blush, I had initially thought that the production of the album had sounded muffled and cluttered. That was before the whole thing was in my hands and exposure to its dense and layered vibe made me realize that a kind of modern shoegaze vibe was deliberately being cultivated here. It honestly fit well within an album that more often than not, looked back to “Sons + Fascination” as a touchstone. As it stands, Andy Wright and Gavin Goldberg co-produced an album that was drastically different to the earlier “Big Music” album that they also helmed for the band. I am fascinated to see if they continue to work with the band, and simpleminds.com recently published a fascinating interview with the pair, illuminating their work and methods here. So as Simple Minds celebrate their 40th year, they appear to be in fine fettle, having produced definitely, their best album since “Sparkle In The Rain!” Years of sometimes painfully gradual progress have begun to speed up a little; giving them a big growth spurt on this occasion. I thought they had plateaued on Big Music” but it seems like it’s conceivable that they could yet further engage my respect and admiration, which…as we have seen, can be very tight fisted with this sometimes vexing band. My sole regret in regards to “Walk Between Worlds” is that the band are not very likely to find themselves treading the boards here in North America on tour even though this album saw them back in the top ten UK album charts at number four for the first time since 1995… and rightly so. Even though you and I know that means they might have sold sold 8000 copies in their first week out. Still, it’s a bragging right that has become fairly common with my favorite “heritage acts” like OMD [also #4] and Sparks [at #7] with their own latest [strong] albums. The UK got a special tour where they played the entire album as the first part of their set and I can now fully understand their decision to do so. It’s already a classic Simple Minds album in my estimation. How I would love to see them play it in America but I have to admit that it’s not going to happen. With just two US tours in the last 23 years, it’s fairly out of the question. When I first listened to this album my “critical hat” was on and I had a very guarded and remote approach to it. On the second playing, it was already tapping into my spinal column and injecting rushes of dopamine even before my brain was done processing its conclusions. It was at that point where I realized that this one was built to ride and I’ve been on it for almost six weeks now and it’s a tight ship. After the dreadful acoustic album that preceded this one, I am well and truly amazed at how quickly and successfully that Simple Minds managed to re-trim their sail and correct their course with such aplomb. Bring on the next one! This entry was posted in Core Collection, Rock GPA, Scots Rock and tagged 2018, Deluxe Edition, Simple Minds, Walk Between Worlds. Bookmark the permalink. If I look at the album proper, ending with Sense Of Discovery – which harkens back to the beginning of the “difficult period” for this Simple Minds fan, but does it’s damnedest to right some musical wrongs – I would have been quite happy with it as a final song. It is a track that provides closure on a few important levels. But then, with the surprise of, say, a hidden track, comes Silent Kiss…Wow, this track just packs a jaw dropping (or maybe shattering) punch. Synthetic in a way that Simple Minds perfected and gifted the Rock world almost 40 years ago – the opening would not have been out of place on Sons And Fascination/Sister Feelings Call or New Gold Dream. The track builds from strength to strength on a bed of complex Motorik foundations and gliding synth-ethics. The final coda, as the song soars past the setting horizon is just magical. But then, not content with leaving us gliding into a rosy sunset, Simple Minds dives down into the sea and crawls out onto the dry land with Angel Underneath My Skin. I too was surprised to see a Mark Kerr composition attached to Walk Between Worlds, but man, does this track work. There’s a weary, weatherbeaten, bravado to AUMS that gets inside you. It is, for me, a very visual song, sung from the perspective of a man viewing the world around him, having replaced the monkey on his back with an Angel deep inside him. There’s a good deal of hope and renewal in this heavy, human song. Since purchasing WBW, I have listened to Dirty Old Town a few times. But it is, as you point out, a song placed on the album, or along with the album as a personal prerogative of those involved. When I listen to WBW, I leave this track off, just as I leave the covers off Graffiti Soul and Big Music. Finally, I have to agree Monk, Simple Minds have found their new risen to an even higher plateau. On first listen, Summer was the track that received the most repeats, then it was Silent Kiss and finally Utopia. There are so many high points on Walk Between Worlds, it just dazzling. Bands old and new will have a hard time impressing me in 2018 in comparison. Simple Minds have thrown down the challenge. Echorich – From my point of view it has the album of the year honors locked up. For what it’s worth, I stopped picking an “album of the year” around 1991! There have been a few in the last 20 years. This is one of them. Oops…I hit Post Comment a bit fast. I meant to address Direction Of The Heart. I have only recently found my way to this song, and I really enjoy it. It makes sense that it is not found on the full release as it has an unfinished feeling, but again it picks from some very important sounds of the band’s past while sounding very current. Kerr’s moody vocal delivery creates a great counterpoint to some very crystalline synth lines. If this is a sound they chose to pursue further, I will be quite interested. i figure this is a good a place as any to post this. i know the summer remix is more current. again, apologize for the spacing. negative1ne – We were missing you for as while. As for not reading the reviews, I get it. I hate knowing too much about a show I’m planning on seeing live ahead of time. If there’s a chance I could be sorely disappointed or am undecided to attend, then I may look at set lists ahead of time. I will say the main set is well considered, and about 20% of the show is fluid. I saw the SM vinyl box news as my friend told me about it. It’ll be in my home email from SM when I get home from work. I’m not buying it, but it is a decent money-spinner for the band. It is satisfying to see these albums in a box together as I like all of them to varying degrees and it paints a good picture of their [well named] rejuvenation. It will tell a good story.